We told you how to "put a rocket in your pocket" a while back by downloading an authentic Atlas rocket launch countdown ringtone to your mobile phone. Now we’ll show you how generating electricity for that phone — or other device — can be as easy as a walk in the park. Exercise may soon do more for you than tighten up your sagging muscles. Advances in biomechanical engineering could use energy generated while walking, hiking or running to power any device requiring portable power, including night-vision goggles and other battery-operated devices used by soldiers as well as robotic prosthetic limbs, cell phones and computers in remote locations where no other energy sources are available. A team of researchers at the Simon Fraser University (S.F.U.) Locomotion Laboratory in Burnaby, British Columbia, are studying the amount of energy that can be generated by 3.5-pound (1.6-kilogram) aluminum and steel knee braces worn while walking or running. Volunteers, wearing a brace strapped on each leg, generated about five watts of electricity per person during a recent experiment, enough power, researchers say, to run 10 cell phones concurrently and twice that needed to keep a computer running (something useful in developing regions of Africa where electricity is scarce). They report that one brace-wearing subject generated 54 watts of power by running in place. The best area to place a device for harnessing human energy is near a joint, because this is where the muscles—the body’s power source—work hardest, says Max Donelan, Locomotion Lab director and an assistant professor at S.F.U.’s School of Kinesiology. "There’s a long history of human power generation using hand cranks and bikes, but these require your dedicated attention, so you don’t do it for very long." The key to energy harvesting is extracting the energy from the body’s natural movement and, aside from breathing, very few unconscious muscle movements are more automatic than the action of walking. Donelan and his team of researchers targeted a particular part of the stride, halfway through the swing of the lower leg after it has left the ground (when the hamstring comes to life to make sure you don’t have uncontrolled extension) through the time the foot returns to the ground. 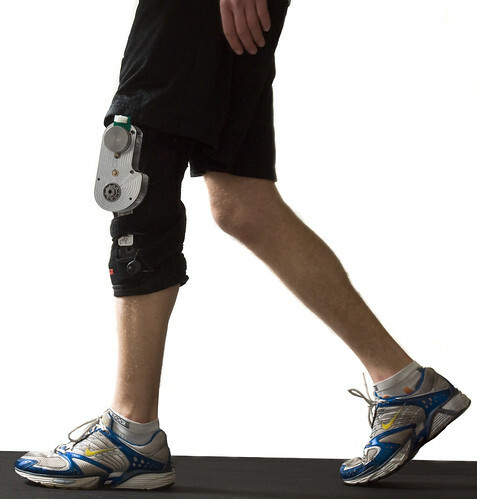 The brace designed to capture this energy features gears, a clutch, a generator and a computerized control system that monitors the knee’s angle to determine when to engage and disengage power generation. The specific amount of energy generated from Donelan’s device depends upon the weight of the wearer, the difficulty of the terrain, the speed of the person’s gait and how long the device is used. In the prototype, energy generated is dissipated into resistors, although future models could include an onboard battery for energy storage. The researchers hope to be able to test their device within a year on Canadian soldiers at a field site. Another effort underway to convert motion into energy relies on the Faraday law of induction, named after English chemist and physicist Michael Faraday, which holds that the movement of a conductor (such as a metal wire) through a magnetic field produces a voltage in that conductor proportional to the speed of movement. M2E Power, Inc., in Boise, Idaho, has developed a system of magnets and coils that, when moved, generates energy that can be used to power their host device. M2E’s technology originated at the Idaho National Laboratory, a Department of Energy–funded research group. Another goal of M2E’s research and development is to develop technology that could be used by the U.S. military. (The Australian army is working with contractors to develop its own wearable, rechargeable battery system, as well.) Much like Donelan’s work, the objective is to eliminate several pounds of weight that soldiers must lug around in the form of spare batteries. M2E has done some work developing prototype energy-rechargeable "D" cell batteries. I like it: power walking. Very cool. This entry was posted on Monday, February 11th, 2008 at 12:20 pm	and is filed under Around the Blogs, Cool Stuff, Front Page. You can follow any responses to this entry through the RSS 2.0 feed. You can leave a response, or trackback from your own site.